On Your Mark, Get Set…. Go!!! Last Sunday, I joined the CUNY School of Professional Studies “Race for the Cure” team comprised of students, faculty, and staff. Being with our team of over 20-strong was such an emotional high for me. 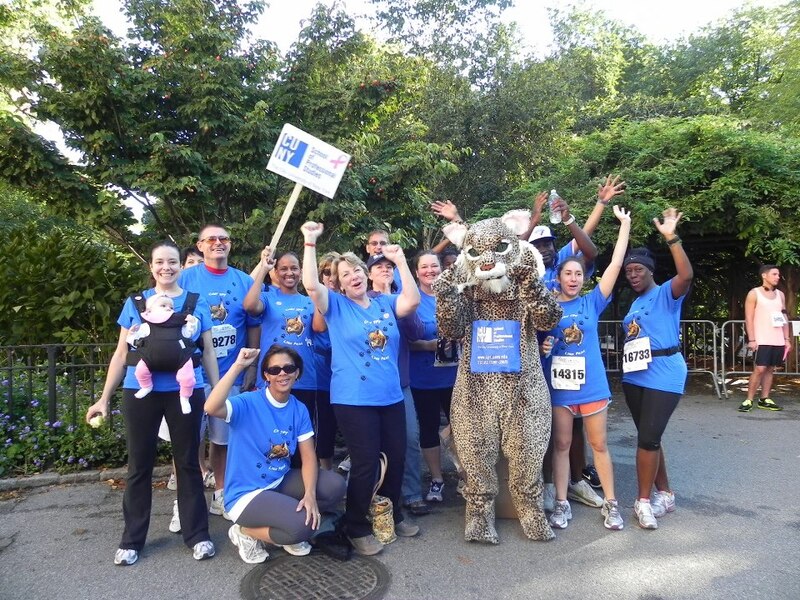 All dressed in our CUNY SPS blue shirts, we (and our mascot, Lex the Lynx) made quite an impression! I was proud to be standing with our school and overwhelmed at the same time with the sea of pink supporters out to fight breast cancer with us. So race day finally arrived and I was eager to attempt the personal (and fairly public) challenge I gave myself: to beat my best 5K time. Why did I go with the public part? Was I over-confident? Was it for accountability? Well, it’s accountability that forces me to report that not only did I #FAIL to beat my last time, I exceeded it by over 2 minutes. First, my excuse! Well, it’s not an excuse—but it’s an observation and a lesson learned. The race was combined with walkers. As a result, the first portion of the race was like playing an intense game of Frogger. I was weaving in and out of people trying to run while large groups were blocking the route. The key take-away for me was understanding that large races can be slightly overwhelming and a rough start. Since I am new to races, I think setting a goal time is an “over-achiever” mentality and I should instead be focusing on my form, my stamina, and my mental game. Speaking of my mental game, my slower time almost had an impact on me during the last few minutes of the run. I remember thinking, “Now that I am running over 10 miles, a 5K should be a like a walk in the park!” Thankfully, when my subconscious is beating me up; sound-bytes from my American Cancer Society coaches speak up. Specifically, this time around, they reminded me that less than 2% of the world’s population has ever completed a marathon. TWO PERCENT! They also kindly reminded me to stop being so hard on myself. I have accomplished so much in such a short amount of time. So by the time I crossed the 5K finish line, the sun was shining and so was my attitude. I celebrated with the team and relished in the excitement of everyone around me. Being a part of the finish line and celebration was a first for me. Usually, everyone is packed up and gone by the time I complete a race. The Highs, the Lows and the HIGHS! The Race for the Cure actually was the final act to a big running weekend for me. On Saturday, I ran for three hours and 6 minutes in extreme weather with my teammate and mentor from the American Cancer Society, Dawn. When the rain set in, we could have stopped and probably should have stopped (as we had no idea there was a tornado warning). Instead, we put our phones in ziplock bags and continued our long run. We made it fun even though we were literally drenched and sledging through puddles (that seemed like mini-rivers). We even sang some favorites (with minor modifications) together while running, keeping each other motivated through any discomfort. 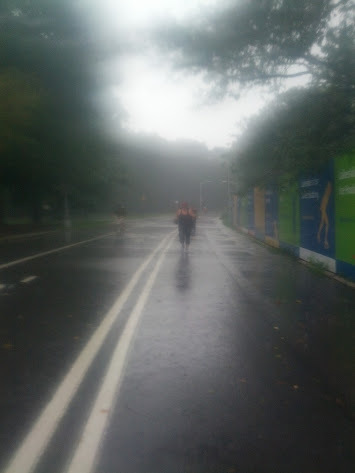 Just running in the rain. What a glorious feeling, we’re happy again! Just singing and running in the rain! Ultimately, I learned an incredibly valuable lesson this weekend. I can’t judge every running day against the last. There are so many factors that change how a run or race will go: extreme weather, health, crowded streets, or lack of energy—just to name a few. Every day is different and every time that I go out there is some victory to be had. As a runner, it’s my responsibility to find that victory and own it. I want to sincerely thank CUNY School of Professional Studies and our Susan G. Komen team. We raised over $800 toward community programs that will help run breast cancer out of town! Alexandra Hertel is an Ohioan living in Brooklyn, New York. She attends CUNY’s School of Professional Studies and works full-time in the events industry. Great post, thanks for sharing your experience.